Salada Beach Cafe is past the Pacifica exit on 280S/ Hwy 1 on Paloma Avenue. If you're looking for a vegan-friendly breakfast or lunch stop on hwy 1 as you're driving down the coast, Salada Beach Cafe is a cute local cafe. Bookshelves line the walls and you're welcome to sip a soy latte and read for as long as you'd like. They have oatmeal or granola with soymilk for breakfast, and a bunch of vegan options for lunch: veggie sandwiches with avocado and homemade hummus, stir-fried seasonal veggies and homemade corn pupusa with veggies... YUM! It's super casual and truly feels like a beach cafe. You can't see the ocean from the cafe, but it is just a few blocks away! They have free Wi-Fi too. 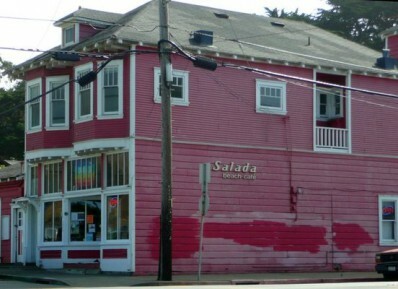 Let us know what you think about this awesome vegan friendly restaurant: Salada Beach Cafe – Pacifica in Pacifica, CA.